Mordenkainen's Tome of Foes is Coming Through the Portal! Deepen your love and knowledge of the world's greatest roleplaying game: Dungeons and Dragons. Mordenkainen is one of the oldest D&D characters created. Once, he was the wizard player character of one of the RPG’s founders: Gary Gygax. However, once Gygax was ousted from TSR Inc., he lost the rights to his arcane character. 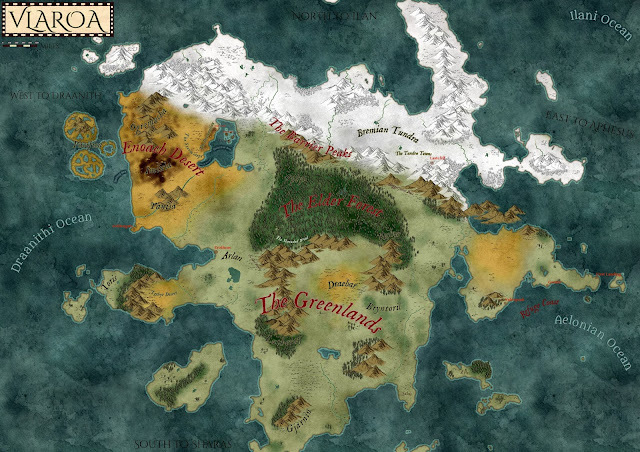 Since then, Mordenkainen has played many roles in one of D&D’s first and most famous campaign settings: Greyhawk. The wizard extraordinaire has been on the opposite side of the PCs, voraciously searching for more power, but he’s also assisted party’s across the world for the betterment of Greyhawk (and his own interests, too). 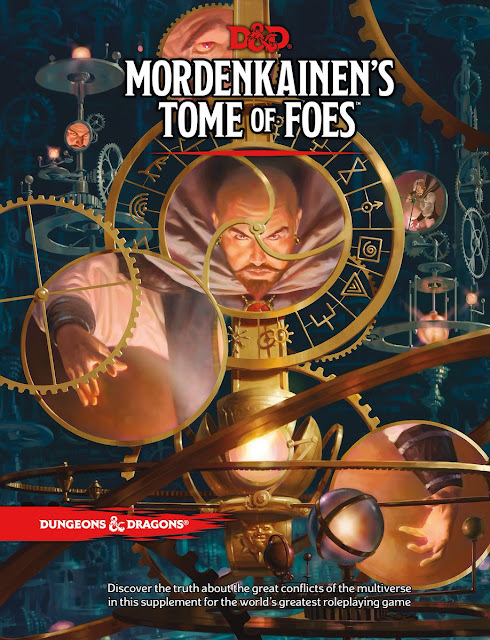 Although a few of his own spells appear in D&D's fifth edition, and the wizard himself finds himself in Curse of Strahd, Wizards of the Coast recently announced that he will be the ‘narrator’ of their next book: Mordenkainen’s Tome of Foes. “This tome is built on the writings of the renowned wizard from the world of Greyhawk, gathered over a lifetime of research and scholarship. In his travels to other realms and other planes of existence, he has made many friends, and has risked his life an equal number of times, to amass the knowledge contained herein. 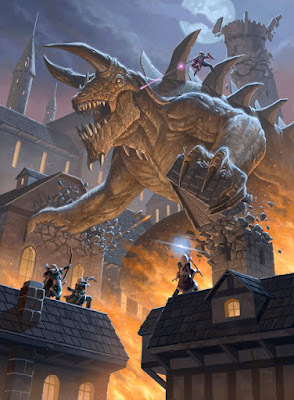 In addition to Mordenkainen's musings on the endless wars of the multiverse, the book contains game statistics for dozens of monsters: new demons and devils, several varieties of elves and duergar, and a vast array of other creatures from throughout the planes of existence." The book releases on May 29, 2018, with 256 pages, and a price point of $49.99 (keep in mind online retailers usually set this to $28-$35). 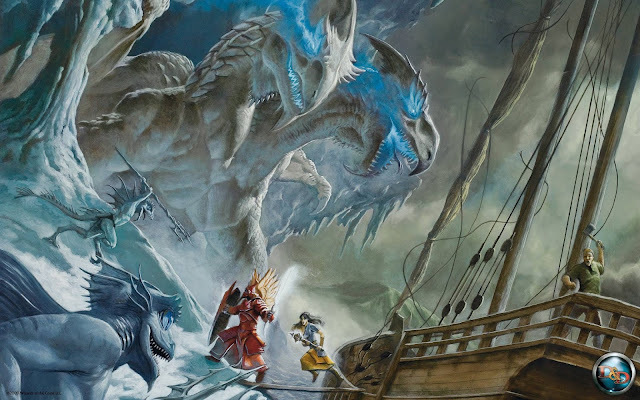 At the moment, Mordenkainen’s looks to be a book akin to Volo’s Guide to Monsters, with a focus on the myriad of extraplanar realms of D&D’s massive multiverse. A Manual of the Planes, updated for fifth edition D&D, you could posit. I’m excited. Why? Keep reading, friends. 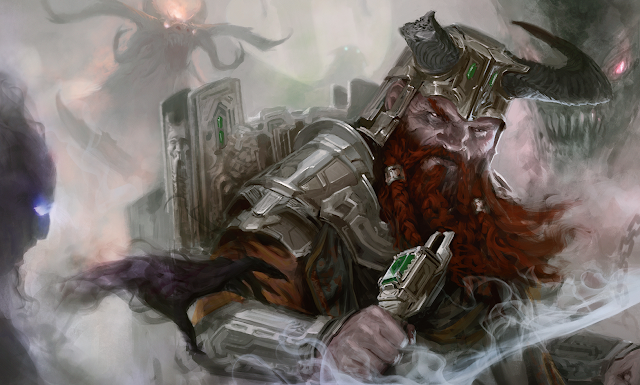 WOTC is trying something new with fifth edition D&D. Gone are the times of Monster Manual I, II, III…, and for that, I’m glad. These new books are superior to those of the past. Volo's had character and oozed inspiration, something the 'monster' books of previous editions severely lacked. Call me crazy, but I adore reading about beholder reproduction, the curse of the goblinoids, and the structure of mindflayer society. If Mordenkainen's is written in the same style as Volo's, I'll be insanely pleased. Time for some speculation, folks. 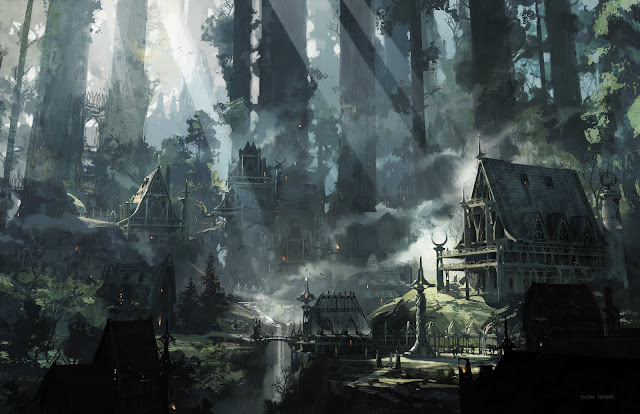 The first section will detail the most famous realms in the D&D multiverse, along with conflicts that beg to be inserted into a D&D campaign or adventure. Examples include the Blood War, Lolth’s eternal struggle, the creation of the slaadi, Sigil, and the Elemental Chaos. Among these, other, smaller bits and pieces of inspiration will be provided. The second section will encompass various options for players who wish to build characters originating from the planes, or connected to them in some way. Perhaps the gith will become a playable race, mystics will be added as a class, and a variety of backgrounds will be provided. The third section, of course, will be filled with stats and descriptions of fiends, angels, elementals, and more extraplanar beings. 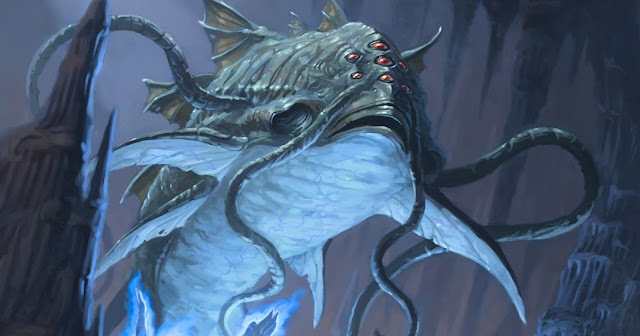 Because the book focuses on extraplanar creatures, I hope WOTC includes a multitude of high-level creatures, meant for campaigns that stretch past level fifteen. 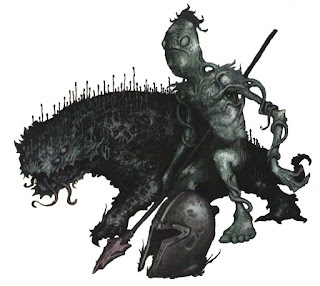 My campaigns have lasted until the PCs hit level 20, thus I’ve often been forced to create creatures without the help of the fifth edition ruleset. With Mordenkainen’s, I wish to see creatures deadly to high-level parties made by the masters themselves. Wizards of the Coast is releasing their next book, Mordenkainen’s Tome of Foes on May 29, 2018. The book’s page count is currently at 256, and its original, bookstore bought cost is $49.99. 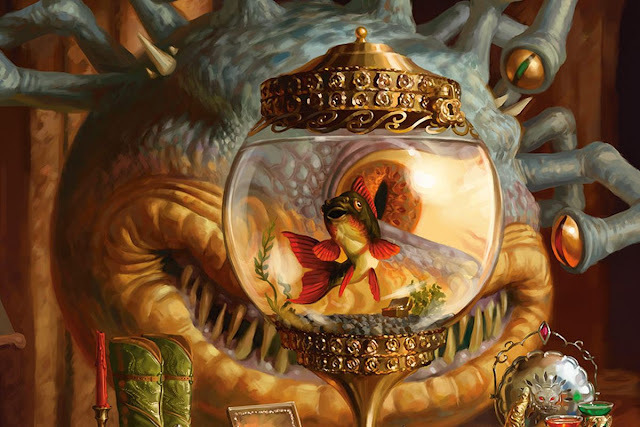 We know we’ll be reading all about the extraplanar realms of D&D’s multiverse, from primeval conflicts to crazy creatures. Within, I hope to see a wealth of ideas, akin to Volo’s Guide to Monsters. In addition, I hope they provide new player options (class, race, backgrounds), and high-levels foes. In the coming weeks, more information will be released, and I’ll continue to speculate in short posts like this one. I hope you enjoyed this short piece, and keep your sight true for more information on this next book; Mordenkainen’s sounds incredible. Check out more of my content on the rest of rjd20.com! Follow me on Twitter, like my Facebook page, or join my subreddit for notifications about my weekly articles. Be sure to leave comments and critiques; I always welcome constructive compliments and criticism! Desperate for a companion in this haunted forest, a shy elf druid pulls out a charred fish and motions toward the crouched lion as green, shining magic courses between her and the animal. In the midst of battle, a near-death halfling wizard pulls out and uncorks a wooden flask, shouting an arcane phrase as water flows from the flask and forms an icy haze around his being. With the only way out the size of a small goblin, a human sorcerer splashes a pinch of powdered iron across the glowing glyphs on her face as she recites an ancient spell and begins to shrink in size. The dry chamber was silent. All the grand chairs were filled, the table was littered with maps, pins, papers, and quills; yet no one spoke. 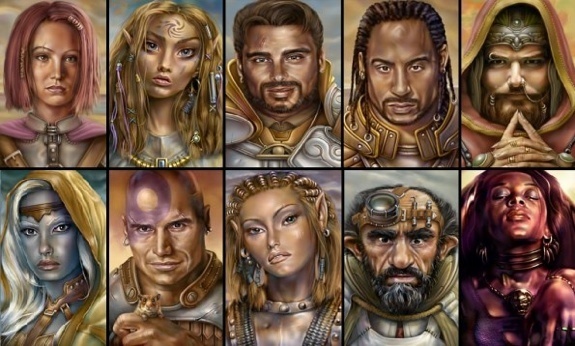 They were all here, representatives from the greatest powers across Aphesus: A mighty dwarven battlemaster from Utgarda; a bloodthirsty gnoll warlock from Dol Dohur; a shy, enigmatic wood elf from Daioda; a zealotos life cleric from Lorinth; a wild halfling atop his raptor from Zinae. Yet no sound emerged from any of them. They all knew the severity of the disaster that brought them together — the decimation of the gnome country Klavangra — but none could muster the courage to speak. In this sultry, remote outpost, they sat, stunned and unsure of what to say or how to approach the matter at hand. Eventually, the silence would break; these are powerful people after all. Surely they’d know what to do. Here in this arid desert hideout, peace would be brokered...or war declared. One of the best ways to define your world to others is to visually outline it. It also helps you envision it while creating more in-depth details of it. Establishing your world’s tenets (part 1) and its primary gods and/or pantheons (part 2) doesn’t need to be visualized. However, when you begin to draw up empires, talk about countries, discuss factions, cultures, monsters, and peoples, it’s good to have something to reference. It’s good to have a map. Follow my daily adventures and musings on Twitter. Read about my homebrew world, Eldar. Listen. Follow. Attack. Kill. The voice continued in the barbarian’s head, drowning out all other thoughts. Her legs kept moving despite her best attempts to cease all movement; her head remained steady and forward facing even though she tried to lower it; her greataxe stayed firmly held in her hand though she tried to drop it. Listen. Follow. Attack. Kill. The voice bellowed again, shattering another piece of the barbarian’s sanity. She felt herself fading. The final front, her mind, and consciousness waned with every word. The beast of the deep was taking her, taking all of her, knowing with her body and abandoned mind, it could easily tear her party apart. Her pace quickened as if anticipating the proximity of the slimy creature. Listen. Follow. Attack. Kill. The barbarian’s eyes went white and her body completely stiffened. Nothing real was left inside, no mind, no heart, no soul. ‘Twas gone. Dead, as her party soon would be... at her puppet hands. A Dungeons and Dragons campaign is a collaborative storytelling experience. Sure, as the dungeon master, you’ll be creating the world your group adventures in, but the epic tales of terror and intrigue you tell will be created by folks on both sides of the screen. Today, we’re discussing the fundamental first step of a successful campaign: Starting with a session zero. Specifically, five tips to maximize the success of your campaign’s baby steps. Holding a session zero has become far more popular as of late. Perhaps it is the push of character’s being integrated into the story, or maybe it’s to discuss what the campaign should be about. Regardless, I’ve been a fan of sessions zeros for quite awhile. They allow both the players and the DM to set expectations about the campaign before it begins. Most of the time, session zeros can solve any problems that may occur during play before they even arise, and they allow the players to participate in the building of the world. When playing or dungeon mastering battles in Dungeons and Dragons, it’s easy to fall into a rhythm or formula. However, it’s integral that you don't do this. Ideally, combat encounters in D&D should never be formulaic, which can often cause them to turn into a slog. To avoid this, all you need to do is add a few different aspects to a battle, to think about the components that compose the fight, and make sure they coalesce to form a fantastic combat encounter. In general, no two battles in your campaign should ever be the same. What do I mean? Let’s take a look! 1: Enemies My premiere tip is to use different types of enemies in every combat. Ensure that the group isn’t simply bashing their heads against a simple hill giant wielding a greatclub with wolf pets, or fighting four spear-wielding goblins in an open field. Instead, spice it up! Happy 2019, folks! 2018 was a fantastic, arduous year for me: I started a blog (this one), married my middle-school sweetheart and love of my life, moved out of my parent’s home, obtained a job writing for my local government, survived two semesters of college, and dungeon mastered three DUNGEONS & DRAGONS campaigns. And so, the new year begins; I’m looking forward to all the good and bad that comes with another year in this world.